The Chronology of the Old Testament was released by Master Books following unprecedented interest and sales of James Ussher’s The Annals of the World. 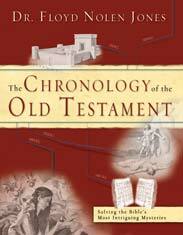 The Chronology of the Old Testament has one goal to accomplish: to demonstrate “that every chronological statement contained in the Sacred Writ is consistent with all other chronological statements contained there- in.” The author carefully and thoroughly investigates the chronological and mathematical facts of the Old Testament, proving them to be accurate and reliable. This biblically sound, scholarly, and easy-to-understand book will enlighten and astound its readers with solutions and alternatives to many questions Bible scholars have had over the centuries. Were there 66, 70, or 75 “souls” in Egypt when Jacob arrived? Were the Hebrews in Egypt for 430 years, or a shorter length of time? How long did Jacob have to wait before marrying the first of Laban’s daughters, and how long did he wait for the second? What year was Christ born? With reliable explanatory text, charts, and diagrams, this book provides a systematic framework of the chronology of the Bible from Genesis through the life of Christ. This page was last modified on 6 August 2012, at 11:02.